Save up to 90% off clearance tiebacks. Save up to 88% off clearance curtains. Save up to 76% off clearance valances. Save up to 50% off clearance rugs. Enter when you "Like" Country Curtains on Facebook. Shipped to the U.S. only. Get up to 10 free swatches. Get a full-color catalog with latest deals and offers. With Country Curtains email sign up. Country Curtains offers curtains, valances, hardware, home decor, shades, bedding, pillows, and more. Use a coupon code to save big on beautiful curtains and decor for the home. The right curtains can pull a room together beautifully. Country Curtains carries elegant, beautiful room decor and curtains for every style, all at affordable prices. Pull the curtains back on more savings by using a Country Curtains coupon – just follow these directions. Find a coupon that looks good to you at CouponPal.com and click "Get Code" or "Get Deal." 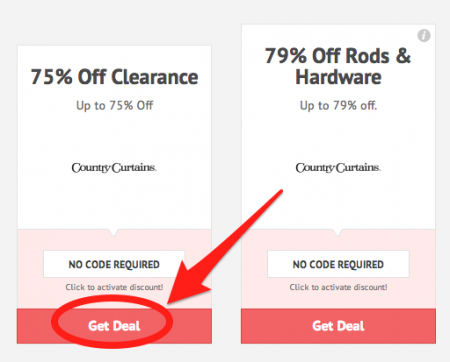 Most of the time, Country Curtains coupons do not require a code. Instead, the discount will be automatically applied when you shop. After you click on the Country Curtains coupon, you'll be redirected to CountryCurtains.com. Shop around at the Country Curtains website to find the perfect curtains and decor for your home. Remember you can specify different colors and sizes for the style of curtains you choose. Don't miss the great markdowns in the clearance section! After you're done shopping, click your shopping basket in the upper right-hand corner of the page. On your shopping basket page, check to make sure you got all the right items. At this point, the discount from your Country Curtains coupon should appear in the price of your items. Next, click "Checkout" to continue with your order. You'll have to enter your payment and shipping information, then submit your order. Your curtains are on their way!